Indica Watson is an British actress from London. Her first acting experience was in a short film for Somerset House in London when she was five. From this she was auditioned for the second series of the acclaimed BBC television drama The Missing and was cast in the role of Lucy. The series was first screened in the UK in October 2016. Indica spent three months filming espionage thriller Deep State in Morocco and Southern England during the summer of 2017. Starring British actor Mark Strong and directed by Robert Connolly and writer Matthew Parkhill, the eight-part series was screened in April/May 2018. 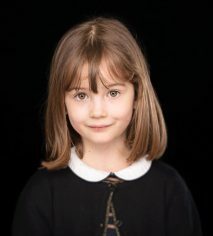 Next Indica appeared as a young girl who was possessed by spirits in Channel 4 docudrama True Horror with Katie Jarvis. The episode was titled The Ghost in the Wall. Indica’s first role as a leading actor comes with Martyrs Lane, a BFI-funded art house psychological horror written and directed by Ruth Platt. Featuring Hattie Morahan as her mother, the feature film will go into production in 2019. 2019 also sees the release of Indica’s second leading role in Nurtured, an independent short film from director Ben Pearce.